This weird item popped up in TfL's press release RSS feed on Friday night. It had no title and the page it links to doesn't exist. 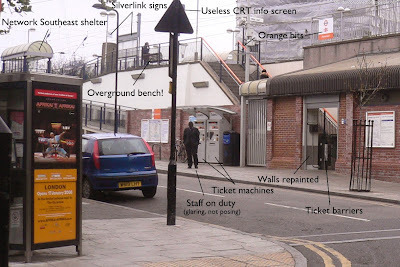 But if it did, it'd be trumpeting the completion of the "second phase of improvements at Homerton station". A mistake, right? Or is Homerton station wonderful enough to be worthy of a press release? Let's have a look. Humble though the improvements are, they are still a big improvement. I used the station last year and it was poorly lit and the platform covered with rats. When I went there last months it seemed much brighter and no vermin in evidence. "The Managing Director of TfL London Rail, Ian Brown, said: 'TfL is now well into delivering the planned improvements for London Overground. 'Hatch Hill station is one of 11 stations that have been deep-cleaned since TfL took over the management of the network six months ago." Not terribly inspiring if the MD can't even get the names of his stations right. Oh dear - separate but basically identical self-justifying press releases for all the different stations or groups of stations.